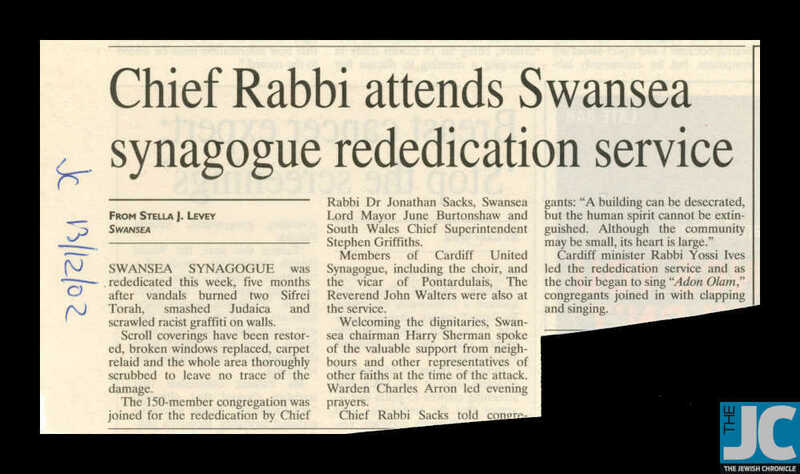 This newspaper clipping from The Jewish Chronicle reports on the rededication service of the Swansea Synagogue five months after it was defiled by vandals. The service was led by Cardiff minister Rabbi Yossi Ives. Among the attendants were the Chief Rabbi Dr Jonathan Sacks, Swansea Lord Mayor June Burtonshaw, and South Wales Chief Superintendent Stephen Griffiths. The Swansea Jewish Community is the oldest modern Jewish community in Wales with records going back to the 1740s. The first formal mention of a congregation dates in 1768 when a small Jewish cemetery was established on Town Hill. After worshipping at several temporary locations, a purpose-built synagogue was erected for the Swansea Hebrew Congregation in 1818. It was replaced by a bigger synagogue on Goat Street in 1859. In 1906, a group of recently arrived Yiddish-speaking immigrants set up a more orthodox congregation as supplementary to the main synagogue. This community, the Swansea Beth Hemedrash, developed independently while maintaining close ties to the Swansea Hebrew Congregation. In 1941, the Goat Street synagogue was destroyed in a German air raid and the congregation continued to worship in temporary premises at Cornhill House on Christian Street. A new synagogue was finally built in 1955 on Ffynone Street. Around the same time, the Swansea Beth Hemedrash was incorporated into the Swansea Hebrew Congregation. The Ffynone Street synagogue was sold in 2009 but the congregation continues to rent a hall in the building for worship.